indication of the kind of work I will be doing here on Kamino, I don't know how long I will be able to stand it. I actually feel sorry for the poor Rebel fools this thing is unleashed upon. 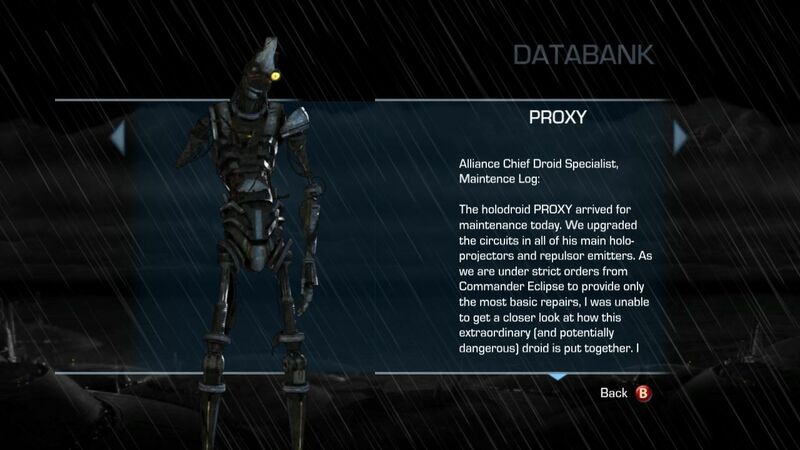 still have no idea who created PROXY and how exactly he operates so many advanced features. 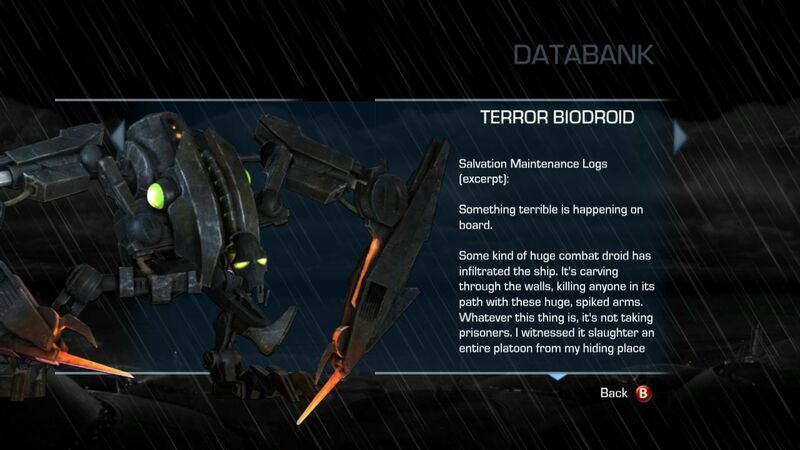 Nothing in the standard maintenance scans reveals how PROXY is able to mimic biological life forms with such believable effectiveness. 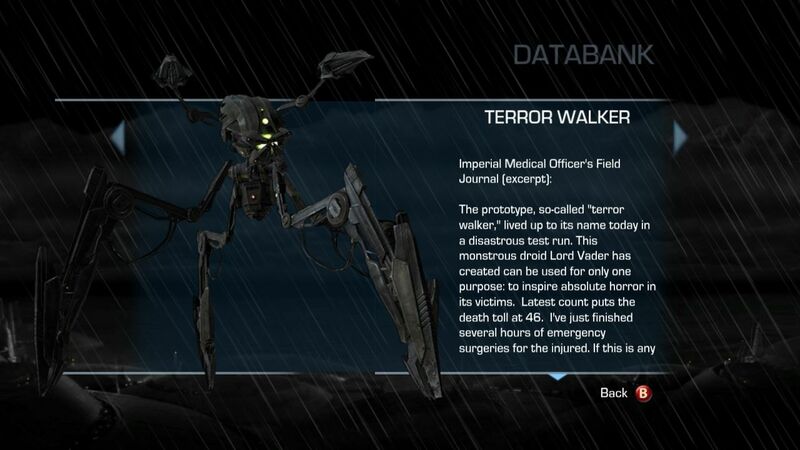 And I've never seen such combat ability in a droid before. I question the wisdom of allowing this droid access to sensitive areas of the ship. It is my official recommendation that PROXY be kept locked down in a secure location and thoroughly examined. There she is. 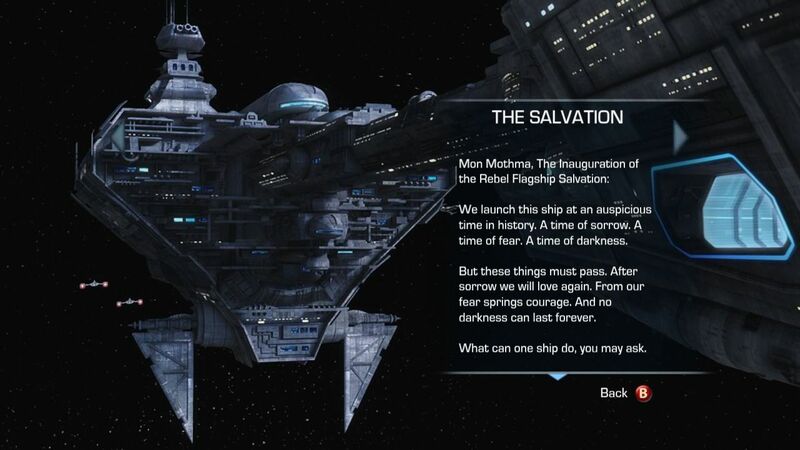 The Salvation may not be the biggest ship in the Galaxy. We may not bear the most guns. We may not carry the most starfighters. But we do carry one weapon that will lead us to victory. We carry faith. Faith in ourselves, faith in each other and faith in the righteousness of our struggle. Against faith, the Emperor has no weapon. Now, I know that some of you have misgivings about me as a leader. 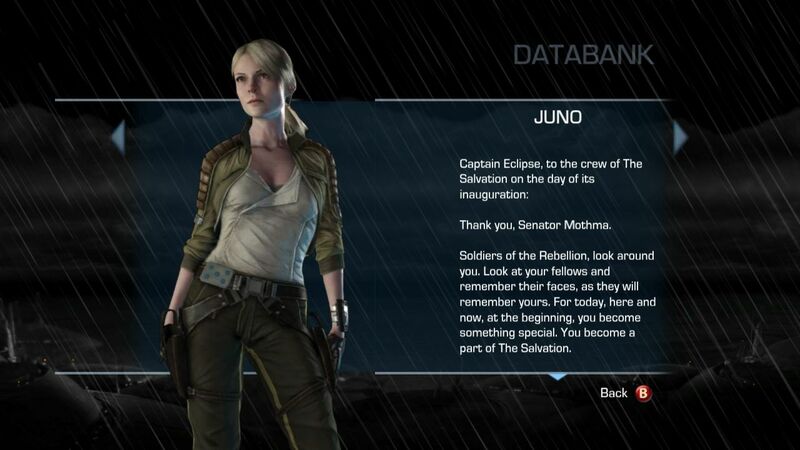 Juno Eclipse, commissioned as an Imperial officer. Commander of the Black Five Squadron. I cannot deny these things. nor would I. I have done the very things that stirs your hearts towards vengeance; I have committed the very atrocities that I now ask you to risk your lives to avenge. I ask this because of these things. I stood at the brink of an abyss, and it was only through salvation that I was rescued. 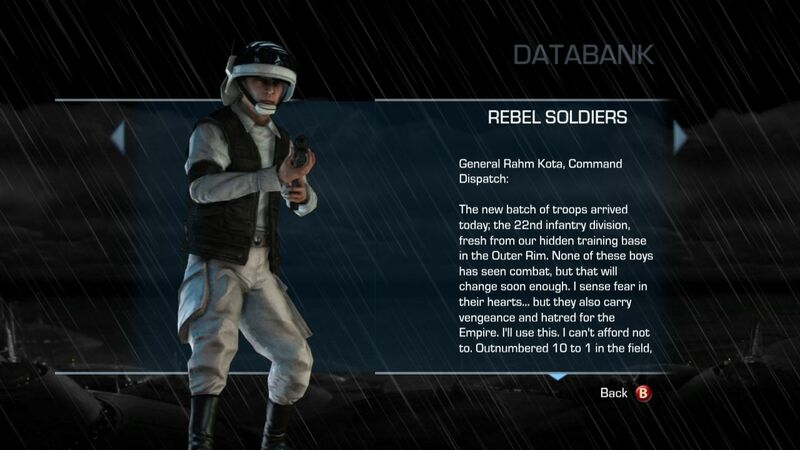 Soldiers of the Rebellion. soldiers of The Salvation. This is the beginning. these boys probably won't survive more than a few months. They'll need more than an inspirational speech and a just cause to be effective fighters. Nix, my second, got himself on the wrong side of an airlock. Vacuum did a real good job on him. Wasn't much left when we got him aboard. Dumb way to go for an experienced fringer. That was it. I pulled everyone off that ship. 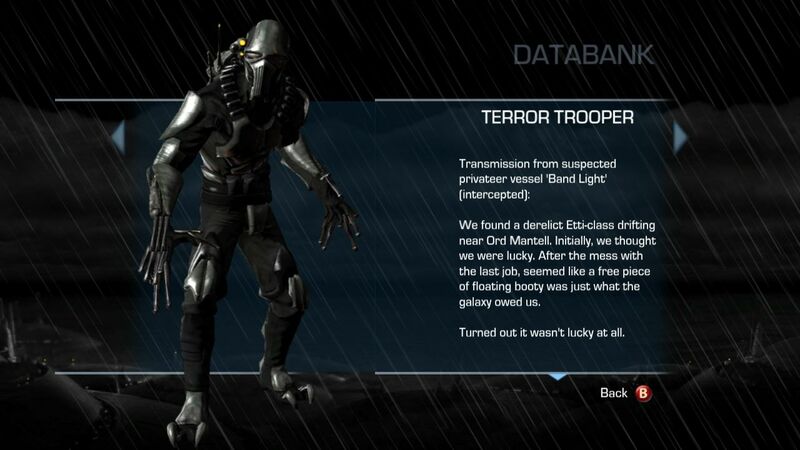 and, if all this wasn't bad enough, now our ship has developed problems. Doors open when no one's there. Lights blink off. I hope we didn't catch a computer virus off that dead ship. in this maintenance hatch. I feel like a coward not helping, but I'm not stupid. I'm no soldier. After this is over, I'm done. I've got to get out of here. I don't know what I was thinking joining this doomed Rebellion. I'm going to sneak off The Salvation when we're back at port for supplies. ship- IT'S GOT ME SOMEONE SHOOT IT QUICK! WHY IS IT FLASHING?" What can one ship, one cruiser, do against the ten thousand ships of the Imperial Starfleet? It can bring hope. Because even in the darkest place, a single light can shine brightly, and shadows flee before it. So long as we stand, and we fight, and we never surrender; so long as we shine bright, victory will ultimately be ours. I bestow upon this ship the name Salvation. May she bring us ours.